← How Brass Instruments Are Born! Mark does all that spectacular photography which the Royal Liverpool Philharmonic Orchestra uses in it’s up-market, contemporary publicity material. Whilst fulfilling a commission to do the publicity shots on the opening of the new multi-million pound, state-of-the-art Liverpool Central Library, Mark had an idea for an entry in a forth coming major international photography/art festival in Liverpool. Entitled ‘The Libraries Gave Us Power’, the results of Mark’s endeavours will be showing at the classy Bold Street Coffee… Take a look in there as you pass. Don’t worry, there will be other faces to look at apart from mine! Also check out the incredible new Liverpool Central library itself and Mark McNulty’s fabulous website (link above). 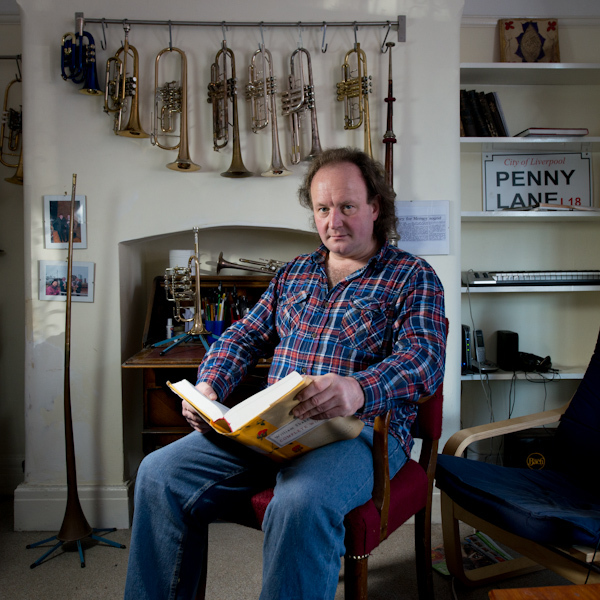 Brendan Ball is a trumpeter with the RLPO and this photograph was taken for The Libraries Gave Us Power exhibition which is on now at Bold Street Coffee in Liverpool as part of Look 13, Liverpool’s International Photography Festival. You can also see the project in this dedicated website designed by SB Studio and the site will be added to over the forthcoming weeks so please get in touch if you would like to be photographed and included. Meanwhile, here’s what Brendan had to say about the Complete Works of William Shakespeare….. I have always been curious about the way people use language and express themselves. For me, Shakespeare makes better use of language than anyone. I try to read a little each day at bed time. Without realising it, we are all probably quoting Shakespeare every day. He is credited with the invention of over 1700 everyday words such as; advertising, critic, bump, and gossip. he also penned many phrases we use; fair play, I’m in a pickle, into thin air and brave new world (these are just from ‘The Tempest’, alone). Shakespeare wrote brilliant sonnets. Sonnet 18: ‘Shall I Compare Thee to a Summer’s Day’ is often described as the most romantic poem ever written, paving the way for modern romantic poetry. Shakespeare’s plays are the best ever written. Hamlet tops my personal list, simply because it is so perfectly written and set a new standard for English literature. Finally, It is the sheer beauty of language that will keep me reading Shakespeare’s writings, forever. This entry was posted in About Brendan Ball, The Gallery and tagged 'Brendan Ball', 'RLPO', Bold Street Coffee, Festival, Liverpool Central Library, Look 13, Mark McNulty, Photography, Rivercool, royal liverpool philharmonic, Shakespeare, Trumpet. Bookmark the permalink.